Voicing is the act of adjusting the tone of the piano. 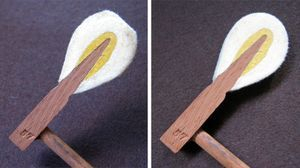 The photo on the left is an example of needling the hammer felt. If the felt is hard the tone is bright. If the felt is soft the tone is soft and mellow. Needling the hammer felts makes the hammers softer. And thus the tone softer. The exact tone a piano should be is a matter of opinion. I prefer soft, mellow pianos. Pianos generally need to be voiced every few years. Depending on two things: how much they are played and how mellow you personally like your piano to sound. If you like harsh, bright tones then you can go many years without voicing. However, if the hammers are too hard they will break the strings. As the piano is played and ages the hammers wear and get harder. The tone can become so bright that the instrument sounds like a honky tonk piano. 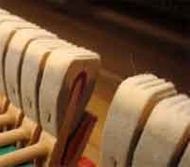 This video shows an example of the process of needling the hammers for a softer tone. As you can see in the video it's a long tedious process. And this is only the beginning. The real work comes in when it's time to make it all even. Which involves playing the piano listening to the tone and making small corrections until the tone is even throughout. As you can see in the photo on the left the top of the hammer (the striking point) is flat and groved. This will make for a unpleasent, harsh, bright tone. Once the hammers wear down and the striking point gets flat the resulting tone is dull, flat and harsh. With such a wide surface area at the striking point the strings are muted a little at the point of contact, which reduces sound quality and tone quality. At this point the hammers must be replaced however this photo shows an extreme example of worn hammer most of the time the hammers can be shaped and reformed. Bringing the striking point back to a rounded edge will greatly increase the tone of the piano. A lot of times your piano sounds bad not because it needs to be tuned, but because it needs to be voiced. 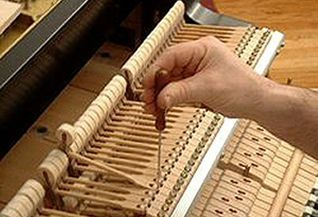 This photo shows piano hammers in the process of being shaped. Bringing back a good striking point and removing the string groves is the first step in voicing worn hammers. This photo show moderate hammer wear, these hammer have many years left on them and can be voiced and shaped a few more times before replacing them. The above photo shows a before and after of a treble hammer. As you can see on the left, the striking point is flat with a large surface area. After shaping you can see how it now has a nice rounded edge (right). This alone will improve the tonal quality, but this was the easy part. Making the hammer uniform in sound and bringing out the best tone possible takes on average about 5 hours of work. A lot of things have to be considered when voicing a piano. First the piano has to be regulated. Regulating is the process of adjusting all the piano action. Regulating a grand piano can take anywhere from 1 1/2 hours to 5hrs. Making a price list for Regulation and Voicing is difficult because every job varies. I can give rough estimates over the phone when I know the age of the piano and the last time it was regulated and voiced.